Shin-woo’s mental age surpasses that of leader Hwang Tae-kyung’s by about 20 years and is extremely considerate. When Mi-nam, who pretends to be a guy in the beginning of “Minamishineyo”, is stuck in the men’s changing room, Shin-woo helps her leave by placing a towel lightly over her head saying, “I can’t wash up if you’re here”. And rather than asking her out on a date directly, he will say, “Thank you for coming with me. I had really wanted to eat the food here.” But all the indirectness and concealing of emotions has only made his presence become less of a concern for Mi-nam. He will speak to himself while holding a gift for Mi-nam in his hands after she leaves him to take care of Tae-kyung, and speak to the wall after Tae-kyung looks after Mi-nam all night when she becomes sick. Of course, like he says, it is for “the well-being of the group and to put Mi-nam’s mind at peace” but he himself soon regrets it. What good is it trying to appeal to her with lines such as “Someone who will like you no matter what? Right here. Whatever you do, I will always applaud you, praise you and smile for you. I make a pretty good fan, right?” The response he gets will be “You’re very warm-hearted, like the person who raised me,” meaning that Mi-nam associates him with the nun at church who raised her rather than seeing him as a real man. So his act of shouting out “This is my woman. The woman I had not been able to speak of!” while trying to stop Mi-nam from exposing her identity in front of reporters, is quite pitiful, even if he is the Shin-woo that the female viewers so dote on. So Kang Shin-woo, call me if you become disgruntled. 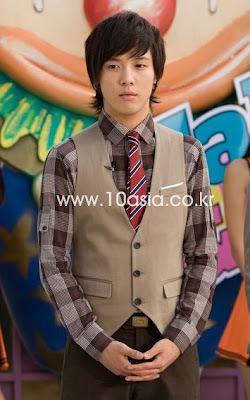 world k-pop news: [news] A look into Jung Yong-hwa's character from TV series “Minamishineyo” "clickable"
0 Response to "[news] A look into Jung Yong-hwa's character from TV series “Minamishineyo”"